To have a space in your home that is sacred and meant strictly for this one intention is a solid way to build up that magic. Think of it like your own personal charger and you’re the cellphone. Just one tiny corner of your home can have a big impact on your daily life, so whether you have a whole room or the top of your dresser, it will serve you. Here’s a guide to making that sacred space for yourself. Pick a part of your home that you can have to yourself. Maybe it is the top of your dresser, or a corner of the living room, or an entire room. Whatever you have, you can make it work. Clear off any unnecessary items and dust it off, and then you may one to cleanse it spiritually with herbs or essential oils if you feel inclined. I love to smoke cleanse with some handmade incense from ground up herbs, spices, and flowers, then spray it down with rosemary, spikenard, sandalwood, and vetiver essential oils in water. By doing clearing, cleansing, and infusing, you are setting the intention that this space is important and putting your energy into it. Out with the old and stagnant, and in with the new and lively. Set your intention with the space you are creating. Your space can bring you peace, inspiration, motivation, wisdom, and love. Or, it could be a place of devotion and sending out gratitude. Or it can be where you ask and manifest. Or all of the above. Figure out what you want the theme of your space to be. Go forth with knowing that this space is just for you, and it can be as personal as you would like it to be. I am personally very elemental, I love to represent the elements by having candles for fire, incense and feathers for air, a bowl of water with essential oils for water, and crystals and herbs for earth. You can have all that, or a simple few things that are sacred to you. It is your space and your choice. This is the fun part of the process. Choose symbols, teachers, people, divine guides, or images of nature that inspire you. Decorate that space with these images in the form of paintings, figurines, sketches, or any medium that reminds you of their message. By constantly seeing these inspiring images, you are able to have that message come into your daily life and act on it. This is what I use to represent spirit. I usually have a picture of a higher being or symbol that resonates with me at that time, one that inspires me for what I need to embody. Right now, I have a big heart in my sacred space as a constant reminder to choose compassion. You get the idea. Another trick to making a space sacred is involving any sensory pleasures you love. This is a great time to pick out delicious smelling candles, incense, or essential oils. Choose a scent that you don’t associate with anything other than this space. It will serve as a reminder of your power images, intention, and message you want to receive. Decorate your space with other meaningful gifts you have received, things from nature you have collected, crystals or items you hold dear to your heart. Make this space your definition of beautiful. It is often overlooked how important beauty is in a spiritual setting, but upon walking into places of worship, we are quickly reminded just how much energy goes into this. This space should delight you, so add what feels good. Once you have finished creating your space, be sure to engage your energy with it every day, or as often as you can. Even if it is just lighting the candle and quickly looking at the images, or picking up a crystal for 30 seconds, fully be present and allow your space to do its job — enlighten, inspire, and hold you. This infuses your energy into the space so it becomes alive and so unique to you, while avoiding stagnant energy. The more you give it, the more it provides for you, and the deeper your connection grows with yourself, to your space, and to something higher. Everyones space is going to reflect themselves and what they hold sacred. It is always amazing to see what other people have created, and gives such a beautiful insight into them. 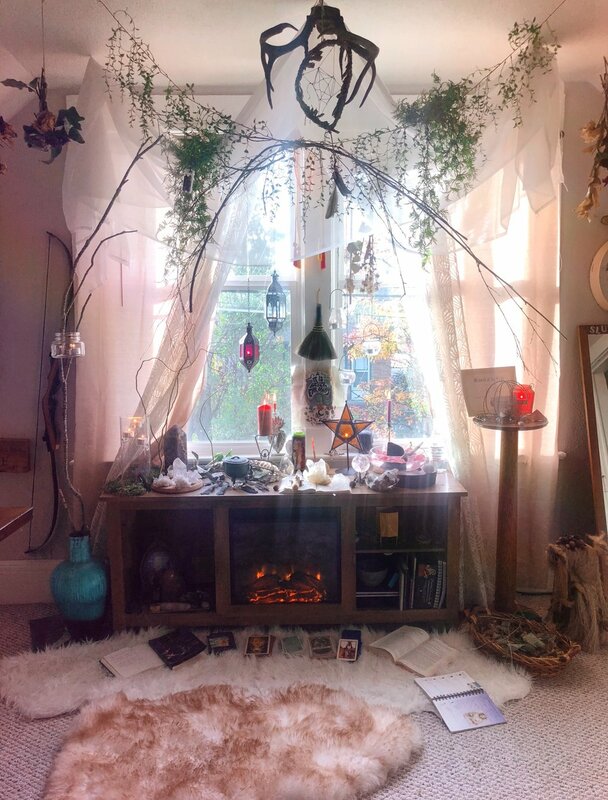 I want to see what your sacred space looks like! Share your thoughts and pictures tips and tricks with me on Instagram & Twitter @kozmicryder or email me here!